Looking for Conservatory Door Repairs in and around the Glasgow area then try A.L.S. Locksmiths. A.L.S. Locksmiths specialize in the repair and maintenance of UPVC door and window locking mechanisms. If your doors haven't been opened in a while there is a risk that the shoot bolts connected to the slave mechanism can rust and the door would fail to open. If this happens A.L.S. Locksmiths conservatory door repair Glasgow can access the mechanism and repair the mechanism. By repairing the mechanism instead of replacing it can save you a small fortune. If your door doesn't quite lock properly and feels stiff or perhaps very draughty it doesn't mean you need a new door. A.L.S. Locksmiths can realign your door and give it that new lease of life that it probably needs. Need new handles? A.L.S. Locksmiths can provide new premium quality door handles for your conservatory, front or back door. All our locking products will last as they have been sourced to last. There is no point in fitting budget handles as they do not last. If you are concerned about the security on your conservatory doors then A.L.S. Locksmiths can help. 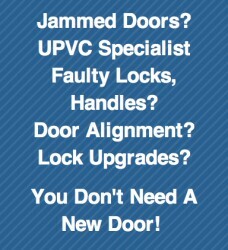 We can provide anti snap locks to your doors. These locks increase the security on your doors and could prevent an unlawful entry into your home. A.L.S. Locksmiths can also provide high security door handles. These handles are secured by design and provide a visual deterent that not only guards the lock but also the mechanism in the door. For more information on A.L.S. Locksmiths products or services please visit our website A.L.S. Locksmiths or call 07712445612 and ask for Steve.